"On Friday the 19 th April Jumperfabriken’s spring collection will be available for purchase at the pop-up shop’s Brick Lane location. Together with fellow Swedes and clog makers Swedish Hasbeens the two brands share the shop, aptly named “Sweden Calling”, at 25 Hanbury St, just off the legendary and multicultural London street. 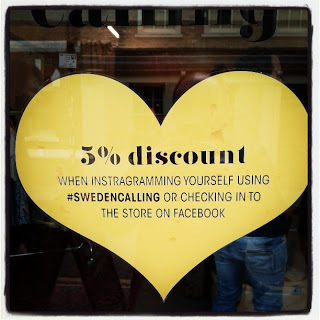 ”We are delighted Swedish Hasbeens suggested that we should join them for this pop-up event. Our brands fit very well together, as do our products”, says Creative Director & Co-founder Elisabeth Synnes. Jumperfabriken’s concept is to create collections inspired by the 50s & 60s, but with a modern vibe, all blended in together with traditional Scandinavian folkloristic designs and patterns. dresses with prints designed by Stig Lindberg as well as a unique mini collection with the traditional Swedish family owned Jobs Handtryck. ”We see great potential in the UK market for our collections. In February we exhibited at Pure London during fashion week, which was a great success for Jumperfabriken. This collaboration with Swedish Hasbeens is the next step for us into the UK market as well as an effective way for us to try out our concept in London”, says CEO and Co-founder Carina Tullis Zervakos."